Need to get away from all that stress and enjoy a great holiday with the family? 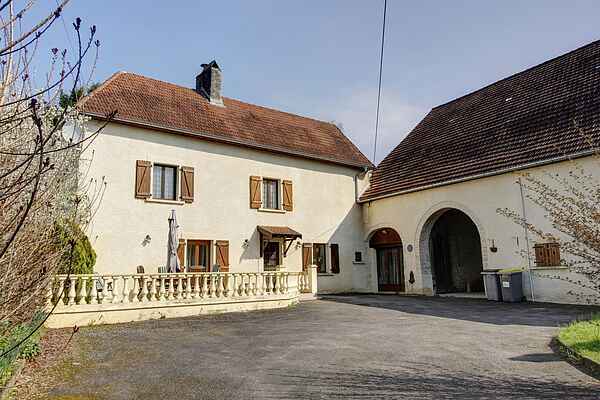 This magnificent, detached holiday home just outside the village of Vanne is the perfect place to do it! It's a true kids' paradise! Take in the view from the large garden, while you relax in the hammock. In the meantime, the kids will gladly keep themselves entertained with all the included games and playsets. These consist of, but are not limited to, a big trampoline, slide, swing set, ping pong table, jeu-de-boules balls, and a Dutch shuffleboard table. Inside the house, you'll be greeted by a charming French interior at different levels, with the exposed beam ceilings typical of the region. What a paradise! You can take a wonderful stroll through the local fields and woods by just stepping outside of your door. Enjoy the area's natural beauty from the water after you rent a canoe in Traves (8 km). Marvel at medieval castles in Fondremand (15 km) and Oricourt (35 km) and take some time to meander through the streets in the old center of Vesoul (25 km). You'll pass beautiful mansions, shops, and charming sidewalk cafes, and you can also visit the Georges-Garret Museum (fine arts and archaeology). A little farther along, but worth the trip, are the caves of Osselle (85 km) and the gorgeous city of Dijon (80 km).